This is a collection of the best Bitcoin and cryptocurrency WordPress themes for ICO, digital currency, blockchain, and crypto news blogs and websites. Digital currencies such as Bitcoin and the nascent Blockchain technology powering it are exciting and revolutionary. Bitcoin is possibly one of the most important inventions in our lifetime. Bitcoin and blockchain can’t be uninvented, and decentralized cryptocurrencies and blockchain technology will change money and the way the world works forever. If you need to build a cryptocurrency blog or an ICO website the WordPress themes below have been designed specifically for crypto industry websites. They have designs and color schemes appropriate for the industry and most include custom cryptocurrency functionality and tools. There are themes available for all different areas of crypto. Wether you’re needing to build a website for a new Initial Coin Offering (ICO), a digital currency or token, blockchain platform, DAPP or service, ICO advisor or consulting, cryptocurrency trading or signals website, mining equipment business, digital currency wallet or app website, ICO review website, or simply a cryptocurrency and ICO news blog, you’ll find a suitable theme below. Our handpicked collection of the best and most popular cryptocurrency WordPress themes below will enable you to launch a professional cryptocurrency and ICO website quickly and easily. The Blockchain WordPress theme is designed for cryptocurrency, ICO, Bitcoin and Altcoin trading, and other related crypto business websites. The premium theme from CSSIgniter is ideal for ICO websites, Bitcoin and AltCoin trading news or trading websites, ICO advisors, and others wanting to build a website in the cryptocurrency industry. Some of the key features and benefits of the Blockchain WordPress theme include: powerful and customizable crypto widgets (select from more than a thousand cryptocurrencies, display total market caps, choose interval performance, fiat currency comparison and all kinds of awesome metrics) cryptocurrency exchange rates tables powered by coinmarketcap.com, support for 7 custom post types (from Projects and Services to Case Studies and Job Listings), custom widgets, page builder support (Custom Elementor modules), infinite color schemes, header customization options amore. 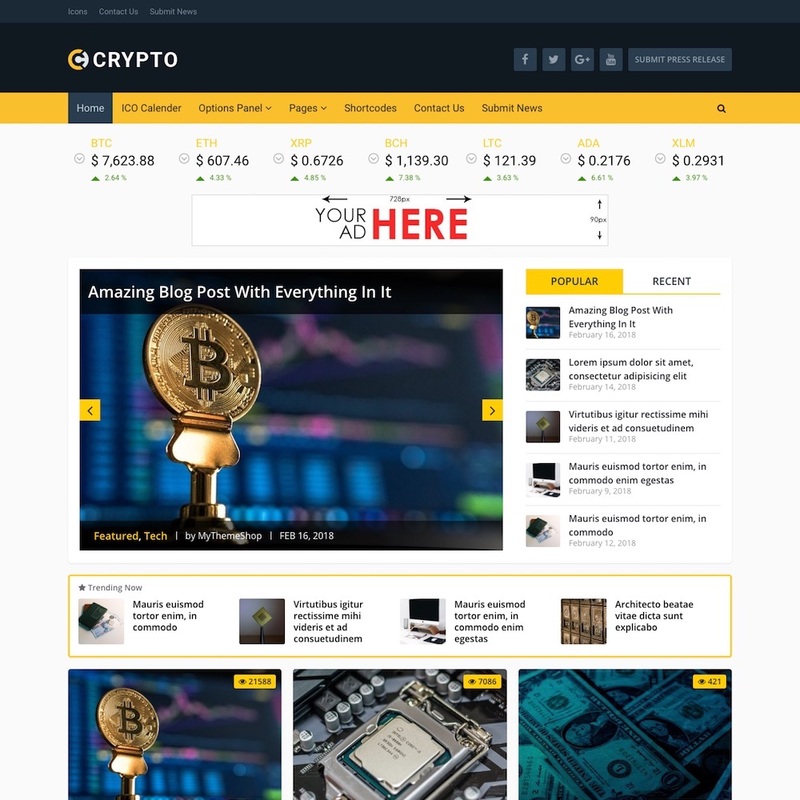 Crypto is a Bitcoin and cryptocurrency WordPress theme ideal for blockchain and cryptocurrency blogs. It has a modern and techy style design similar to other popular crypto news blogs. Apart from all the regular blogging, customization features and layout options found in a good premium WordPress theme, Crypto also includes many custom features specific for cryptocurrency websites. Some of the key features and tools include: ability to show live coin prices, create dedicated coin pages, show historical price data, compare coin prices against different currencies, dedicated coin widgets, ICO directory archive page, and much more. 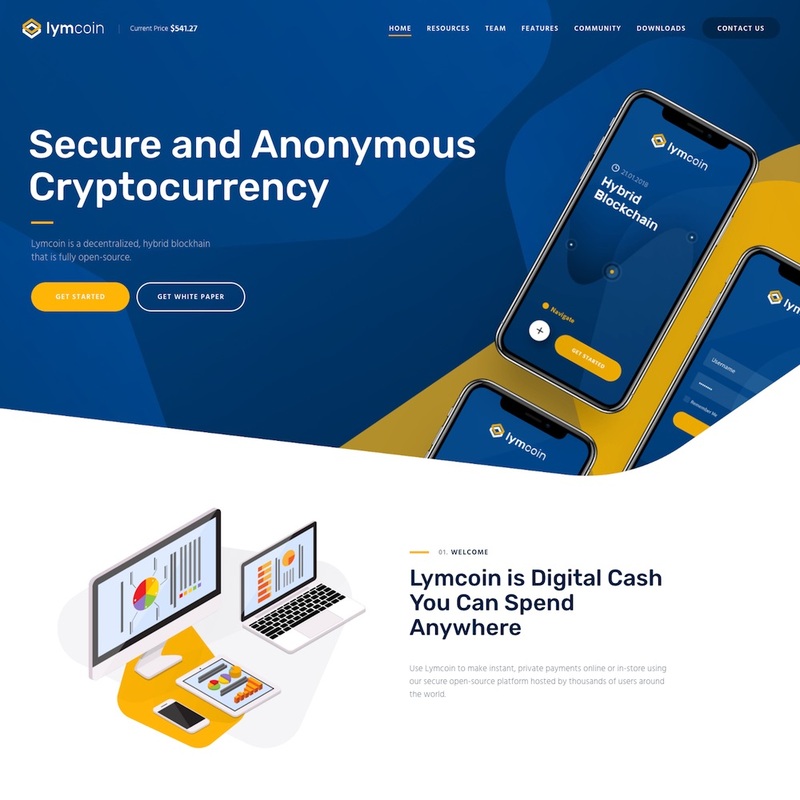 Lymcoin is a cryptocurrency WordPress theme designed for crypto, crypto mining and ICO websites. It has a modern and unique design. The homepage allows you to display your coin or ICO information and features, benefits, roadmap timeline, partners team, and advisors lists, network and wallet information, charts, events and more. 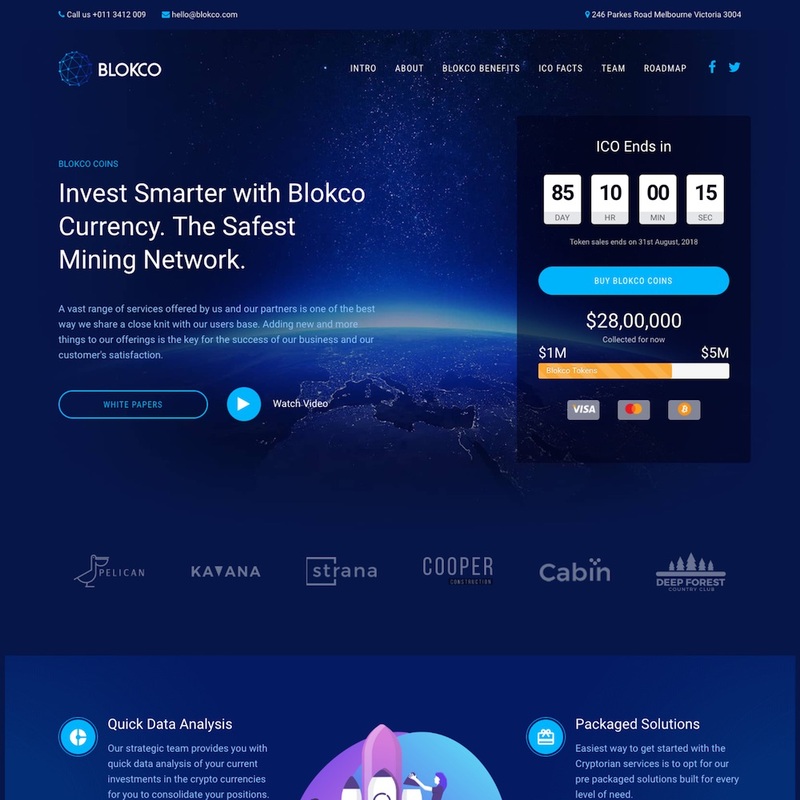 Blockco is a powerful and feature rich WordPress theme designed and developed for cryptocurrency websites, ICO websites and landing pages, finance, fintech and other related business websites. It has a clean and professional design with numerous premade styles and lots of different layout and customization options to suit your specific needs. 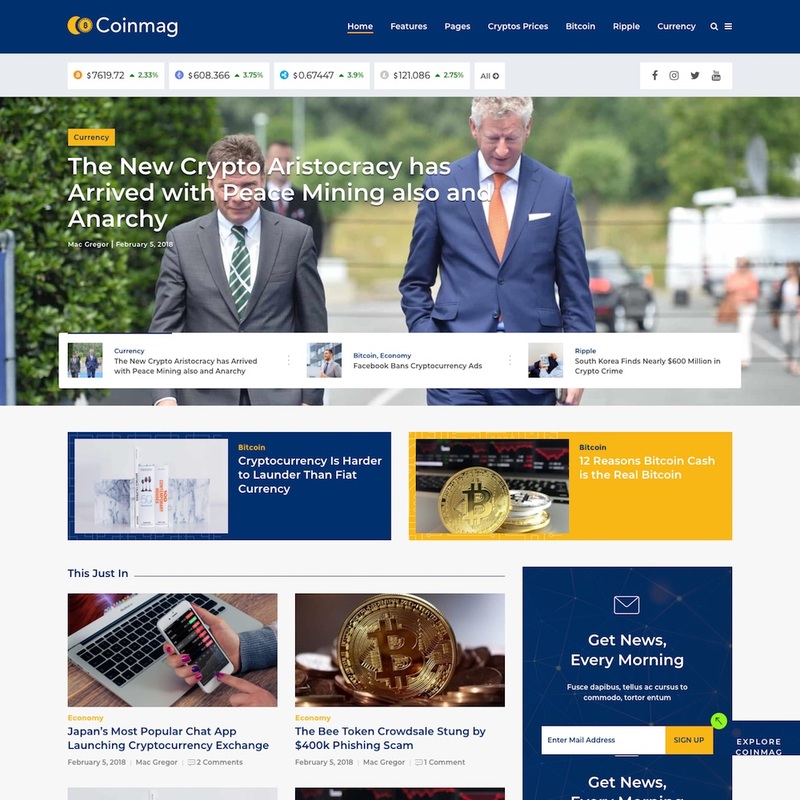 Coinmag is a WordPress theme designed specifically for Bitcoin and cryptocurrency blog and magazine websites. The theme is designed to be SEO optimized and fast loading so you can rank well in the search engines. It includes a crypto widget (ticker and header list) for displaying the latest coin prices and percentage changes. It has a nice magazine style design and lots of other useful features and design customization options. 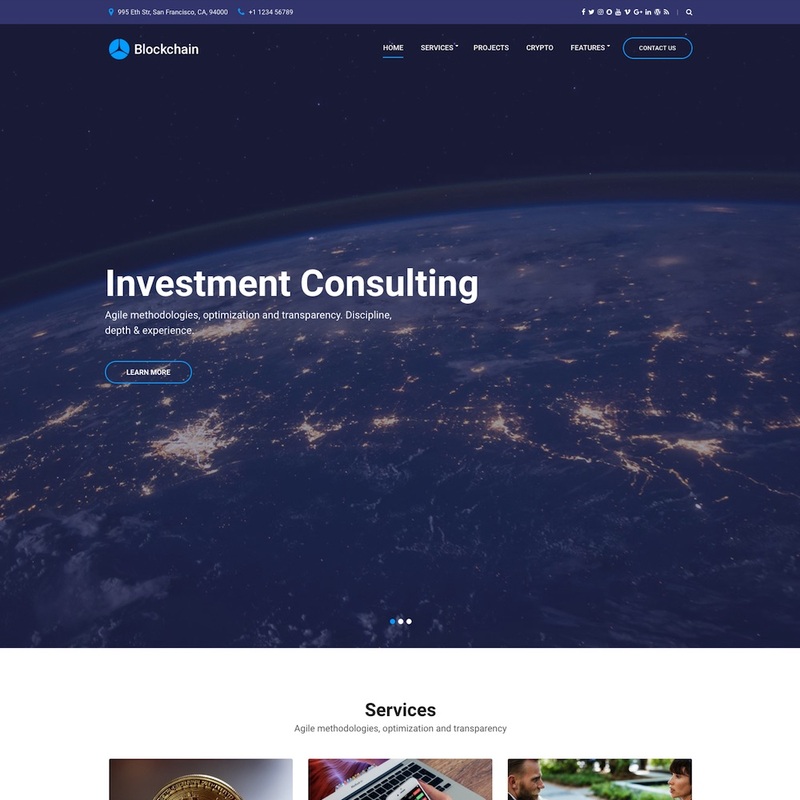 Blockcaten is a powerful and flexible WordPress theme designed for cryptocurrency and blockchain consulting websites as well as other related financial and consulting websites. It has a clean and professional design with a number of premade design layouts and lots of other customization options that let you build a professional looking website without needing to code. 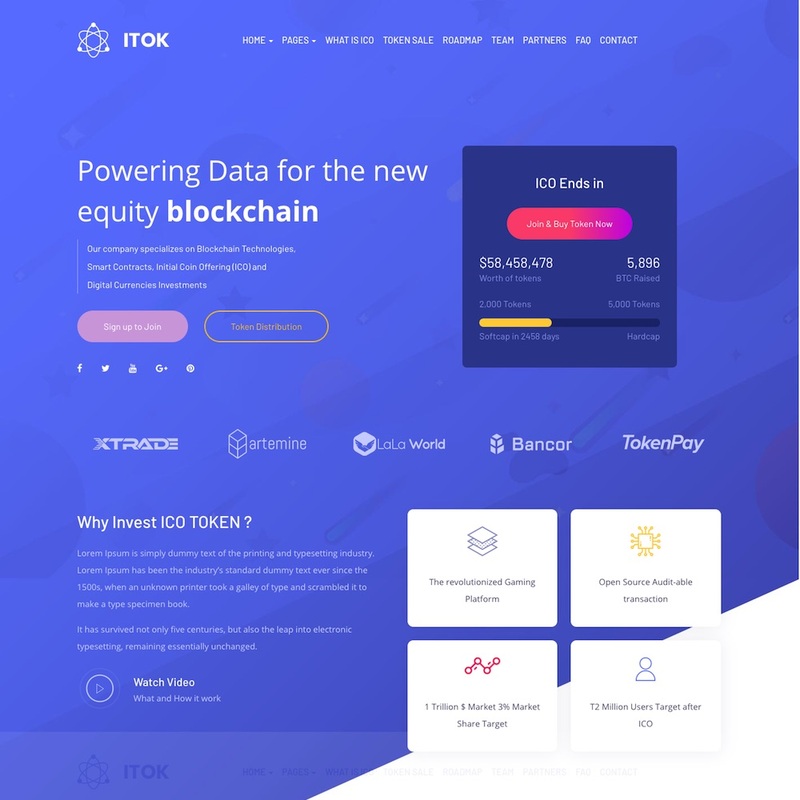 ITok is a WordPress theme for an Initial Coin Offering (ICO) website. It has a modern one-page design that lets you display all the information about your ICO on the homepage. 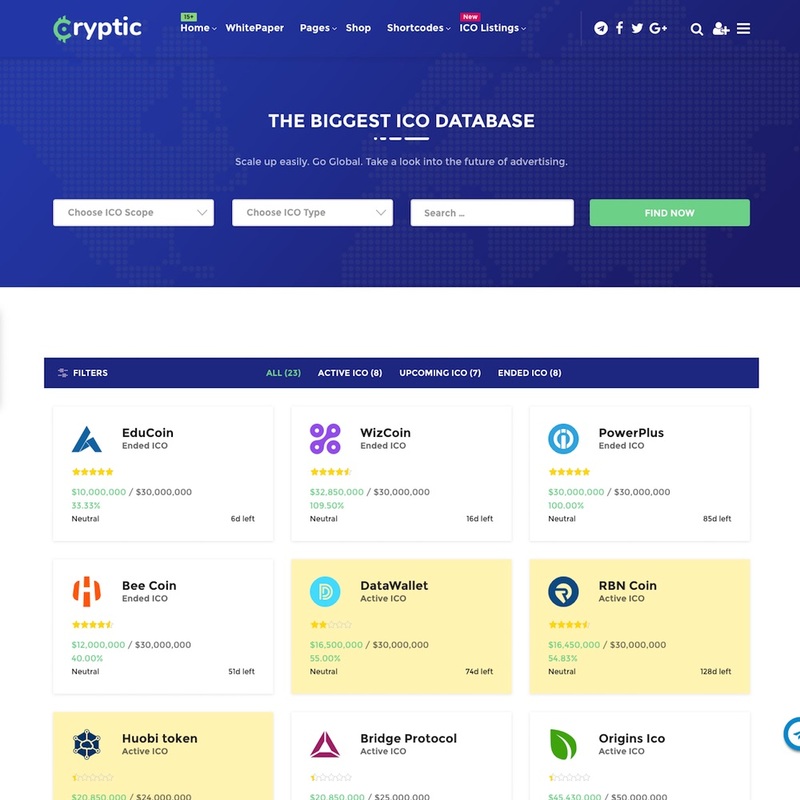 You can display information about your ICO and token sale, the team, roadmap, partners, FAQ, graphs and everything else for a professional looking website to launch a successful ICO. 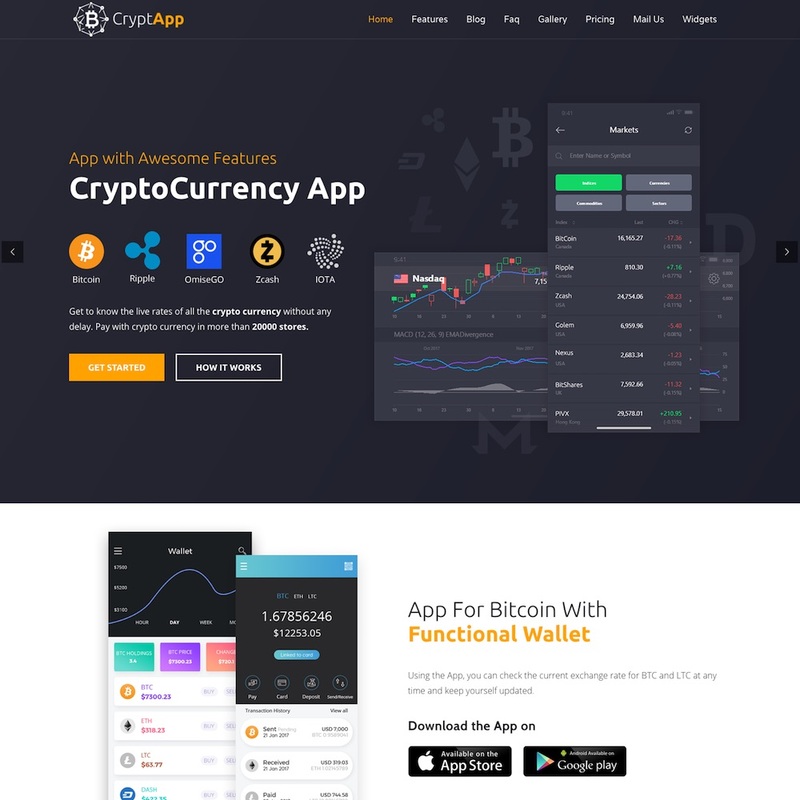 The CryptApp WordPress theme is designed for cryptocurrency landing page, cryptocurrency apps, cryptocurrency wallet websites. It comes with 4 unique homepage designs for showcasing your crypto mobile app, wallet, mining gear, products or services. It has a number of custom crypto widgets such as a Bitcoin calculator, coin price ticker, price charts and others. It has a lot of other features and customizations options to easily built a professional and feature rich website. CoinzFactory is a WordPress theme designed for the FinTech industry. The theme is ideal for ICO websites and landing pages, cryptocurrency and blockchain blogs, Cryptocurrency Wallets, Professional Cryptocurrency and Investments Consulting Service, ICO Advisors, or cryptocurrency mining and equipment online magazines. It has a simple, uncluttered, bold and professional design that lets your content shine. It has 10 coin widgets, real time exchange rates, coin exchange calculator, plus lots of customization and content options. 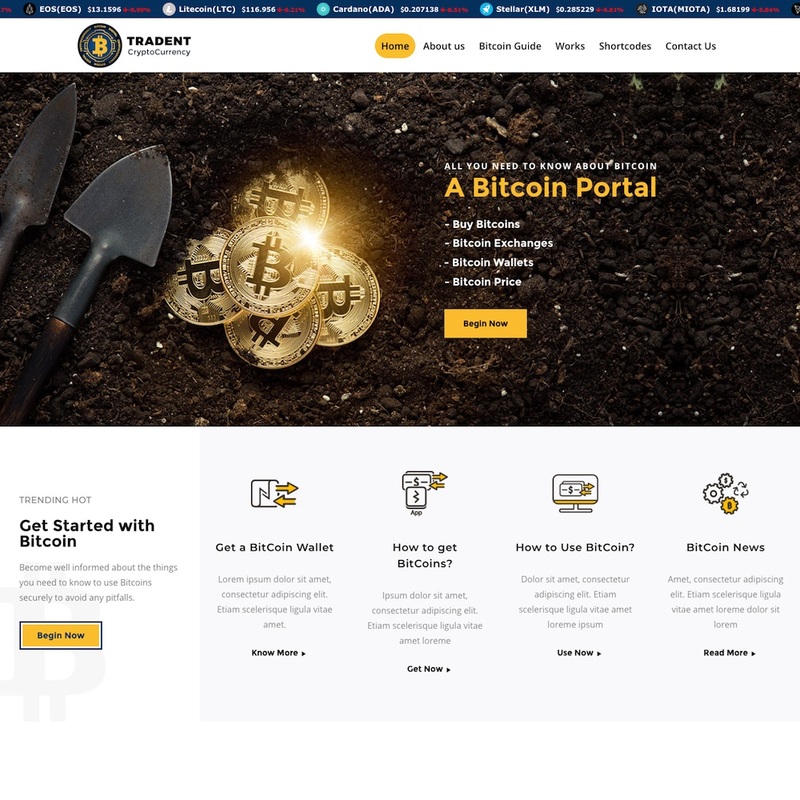 Tradent is a WordPress theme built for cryptocurrency and Bitcoin websites. 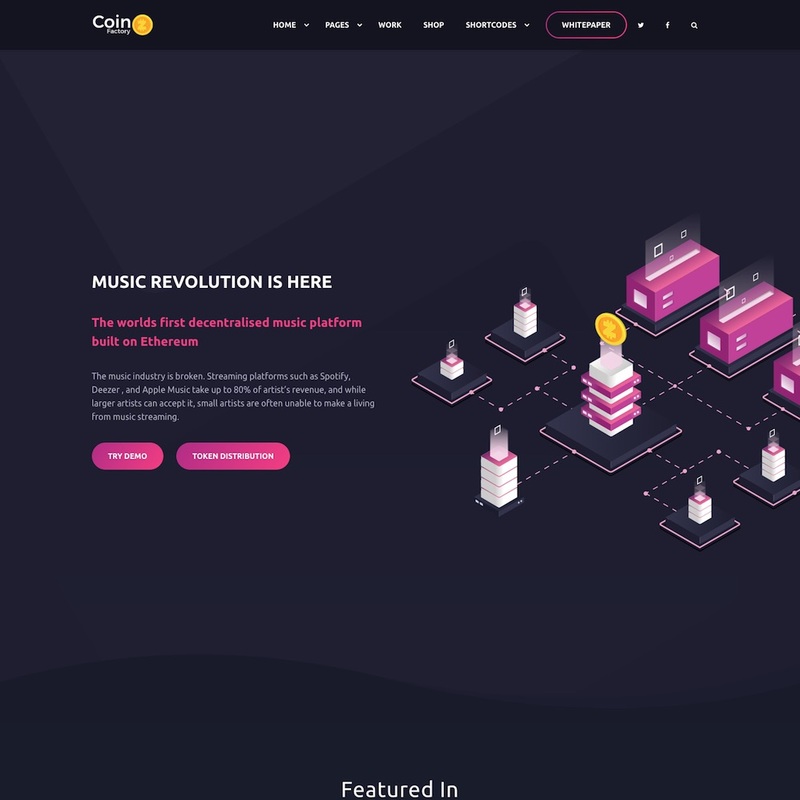 The multipurpose theme could be used for ICO websites, Blockchain and cryptocurrency news and information websites, cryptocurrency investment and trading websites and services, product websites for apps or wallets or any other crypto industry website. 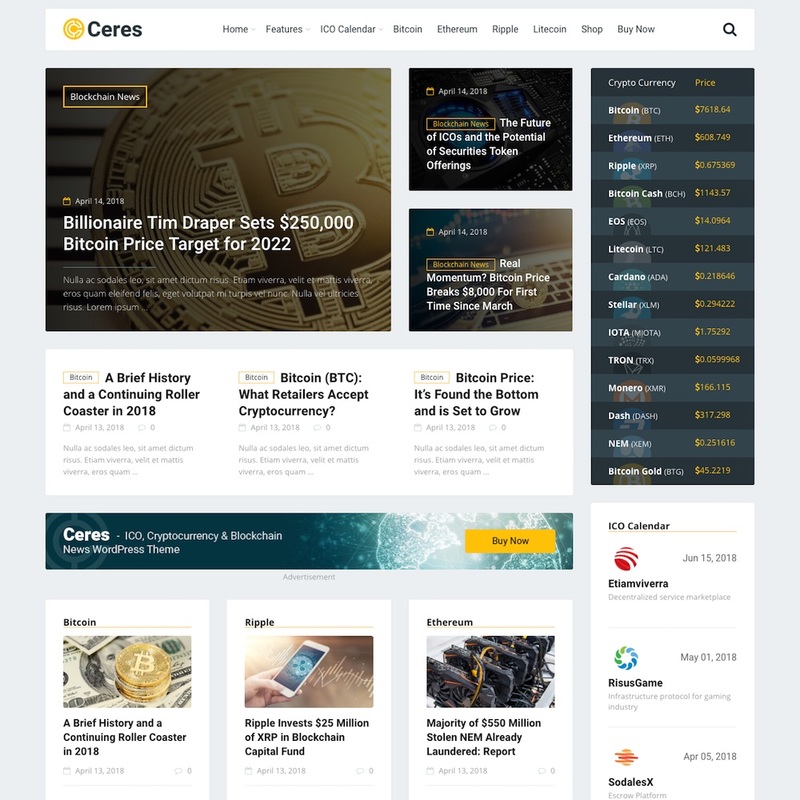 The Ceres WordPress theme is designed for Cryptocurrency, ICO and Blockchain news blogs and magazines. It has a modern and professional design and comes with a custom ICO Listing Directory functionality. It has 6 post layout options, custom widgets, a fully responsive design, mega menu, sticky sidebar support, crypto currency price list widget, and various customization options. 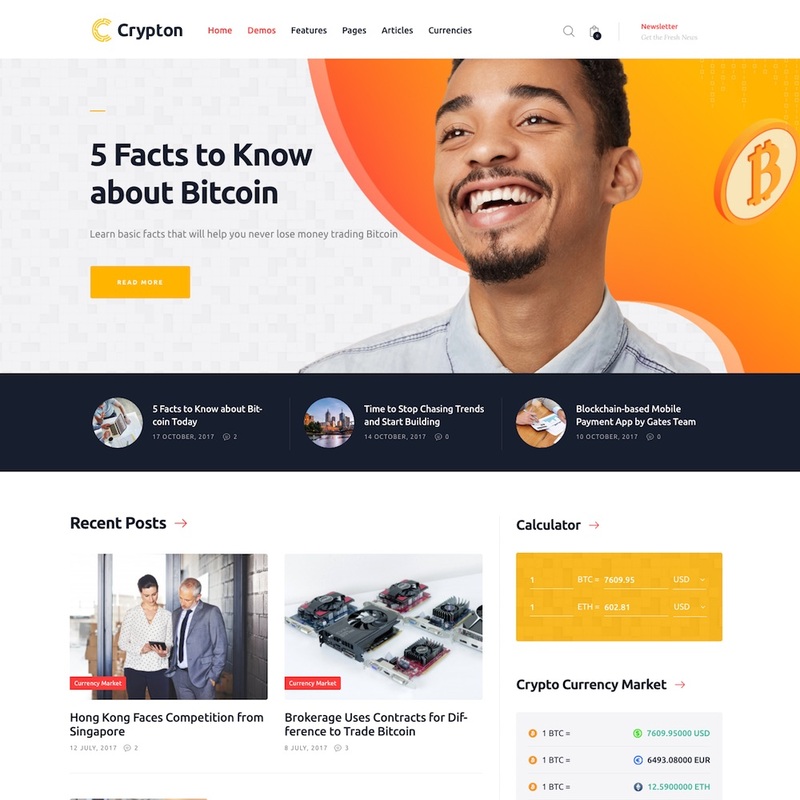 Cryptro is a powerful WordPress theme for Bitcoin, Blockchain, cryptocurrency, cryptocurrency magazines and blogs, ICO websites, financial technology and FinTech service websites. It has a sleek and modern design, and also comes with great cryptocurrency feature such as ICO countdown module that allow you to set up a stunning ICO countdown box to your potential investors, Bitcoin chart & Bitcoin news widget, Price label, Change label, Price card, Change card, Currency Converter, Currency Table and more. 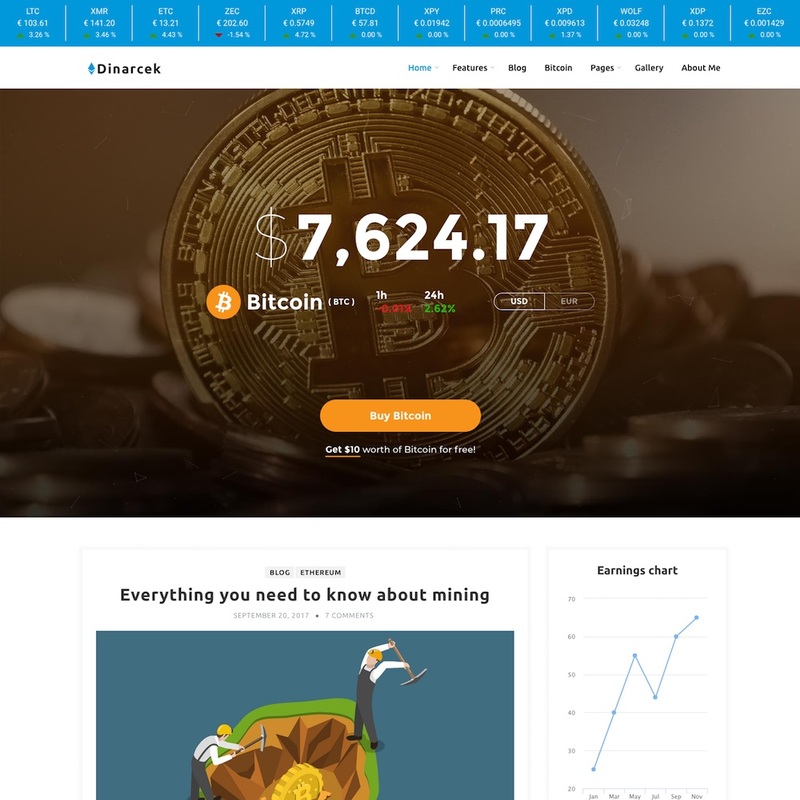 Dinarcek is a simple WordPress blog theme for Bitcoin and cryptocurrency blogs. The theme is designed to work with the free Bitcoin and cryptocurrency WordPress plugin that allows you to add coin charts, graphs, exchange rate tables, Bitcoin payments etc. Cryption is a WordPress theme created specifically and optimized for the cryptocurrency industry. The theme is ideal for building websites for ICO’s ICO advisors, Blockchain consultants and crypto businesses. If your building a coin and launching an ICO you need a great website so that you can promote your coin and get your ICO up and running quickly with complete visibility to your vendors, partners and investors. This theme allows you to promote your ICO progress with features like a countdown timer, a place to house your White Paper, and a means to display your coin distribution. It comes with 6 creative homepage design concepts and lots of features and customization options. 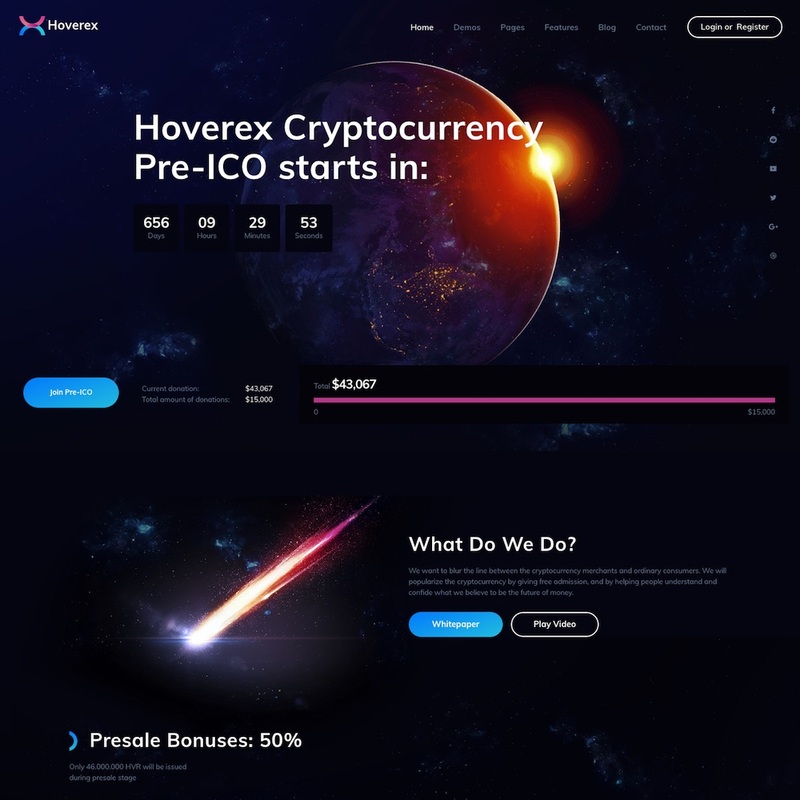 Hoverex is a Cryptocurrency and ICO WordPress theme. It is a flexible and multipurpose theme could be used for ICO’s and official cryptocurrency coin websites, cryptocurrency blogs and online magazine, blockchain specialists, mining equipment sellers, cryptocurrency exchange, mining rig blog, ICO advisor, ICO Agency, cryptocurrency trading markets and others. It has 8 unique homepage variations, 20 custom inners pages, 21 header and footer styles, 150 special elements, as well as lots of customization options and features to help you build a unique and professional looking website for your coin or ICO. 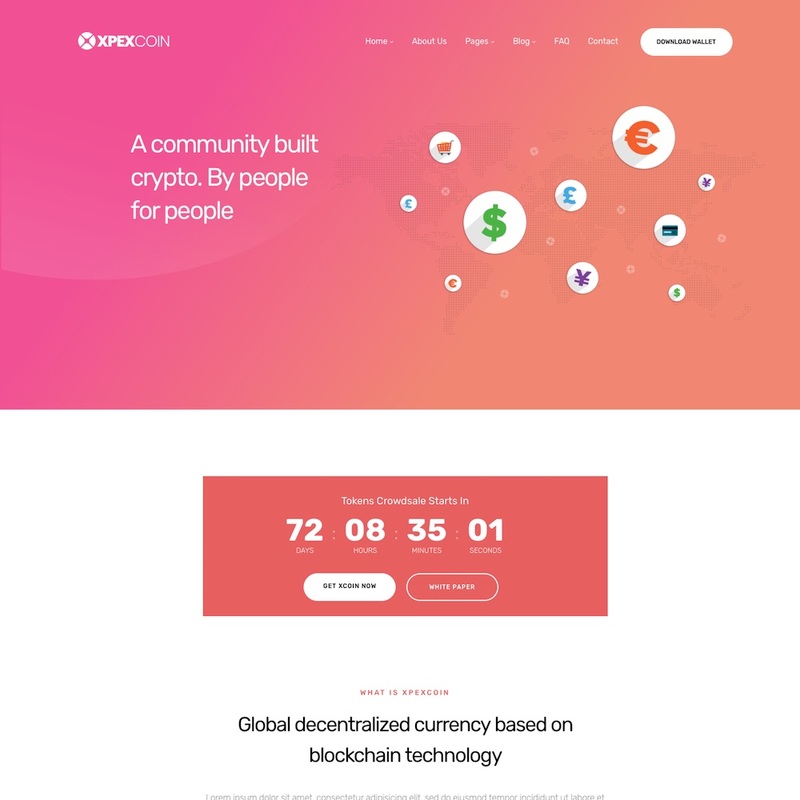 Cryptokn is a cryptocurrency and ICO landing page WordPress theme for new coin projects. It includes a number of different homepage layout options and lots of built in options to tweak and customize the design to suit your project. 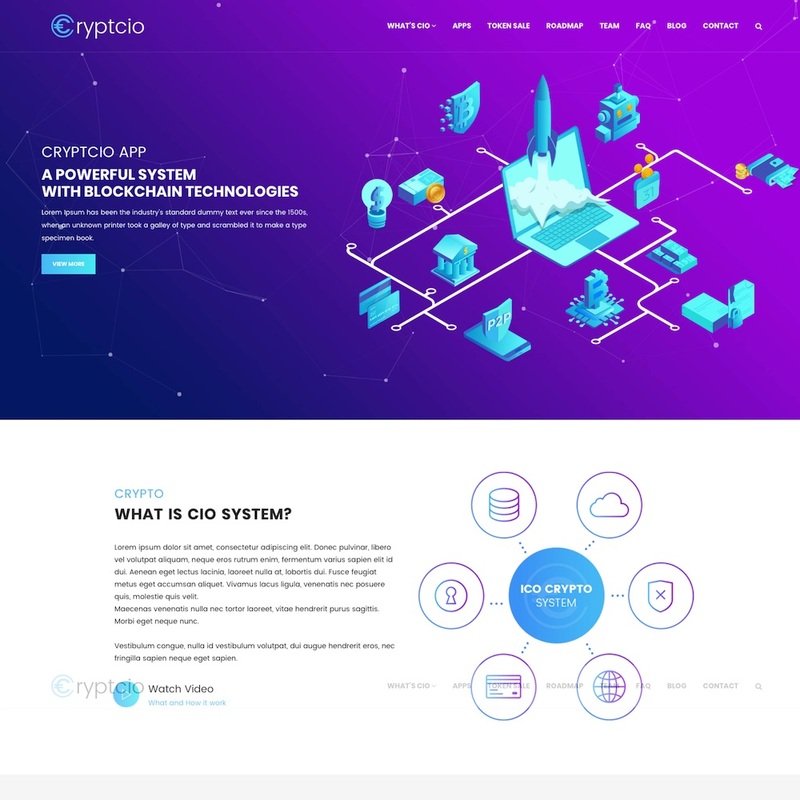 Cryptcio is a professional looking multipurpose WordPress theme suitable for crypto and ICO websites. It comes with a Bitcoin calculator, Coin Charts plugin support, virtual coin widget (provides 10 widgets for your WordPress page, so you to can share with your visitors market information for 1000+ crypto currencies), powerful page builder, admin panel, customization options, WooCommerce support and more. XPEXCoin is a powerful Cryptocurrency WordPress Theme for ICO websites and token sales. It has a clean and minimalist design with 2 homepage variations. XPEXCoin makes it super easy to elaborate all details about your team and your project in multiple pages such as About Us, How It Works, Team, Resources, FAQ, and Contact. There are numerous handy elements and templates for you to effectively showcase cryptocurrency consulting and promote your cryptocurrency venture including custom Pie Chart, Progress Bar for timeline, Service sections, Real-time Exchange Rates, ICO Launching countdown, Cryptocurrency Calculator, Static Tabs, Testimonial, Latest News, Subscribe Form, and so on. 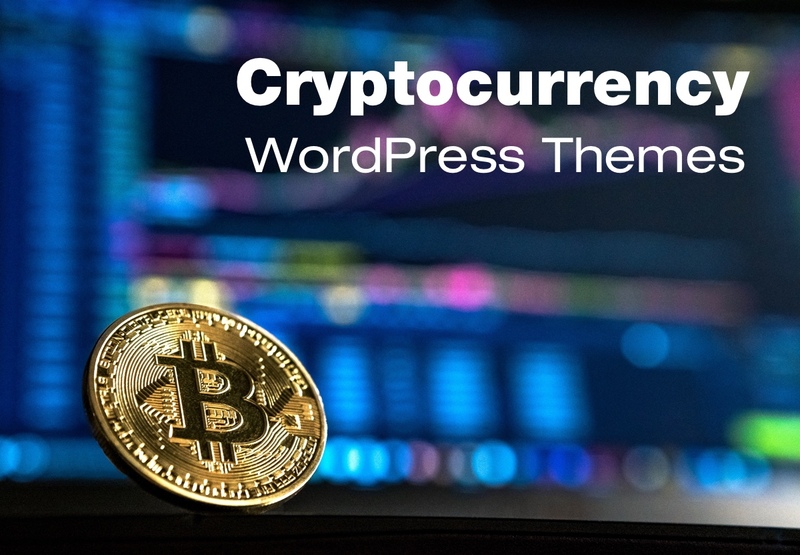 Cryptic is one of the most popular cryptocurrency specific WordPress themes available due to its sleek, professional and versatile design options and extensive list of features and functions. 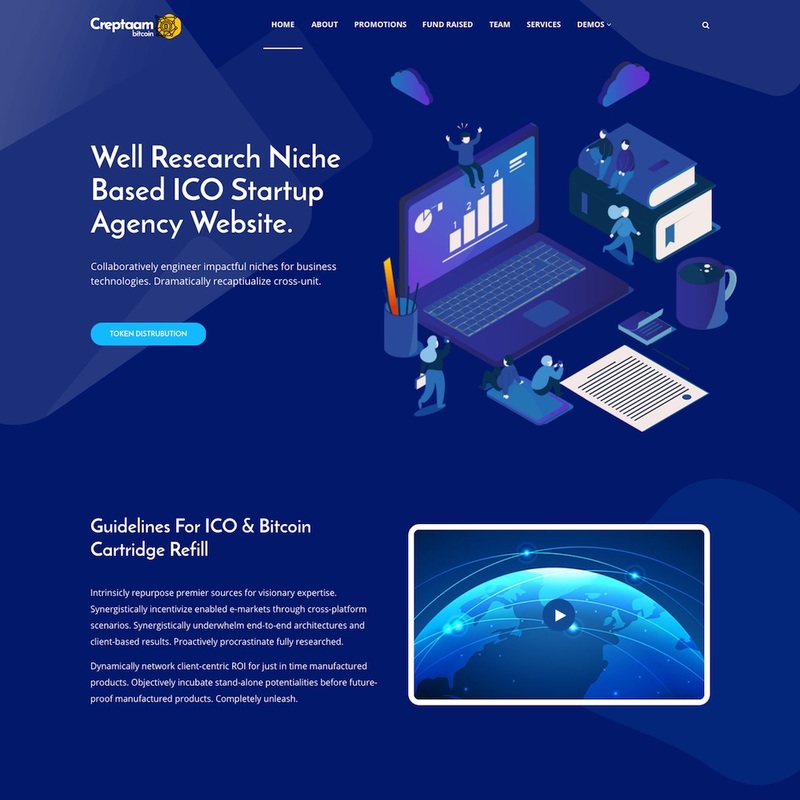 The theme has been designed specifically for the cryptocurrency industry and has lots of alternative homepage layouts (15+ variations) and is ideal for ICO websites, Bitcoin and crypto trading companies, blockchain consultancies, ICO advisors, ICO review sites, and any other crypto venture. The theme includes some really neat cryptocurrency specific features and tools such as a Bitcoin explorer (allows you to explore Bitcoin addresses, hashes and transaction codes), ICO directory system, cryptocurrency calculator (prices and exchange rates, list of all cryptocurrency, candlestick price charts etc), tickers, statistics, live price updates to even a White Paper page which you can use for your ICO. 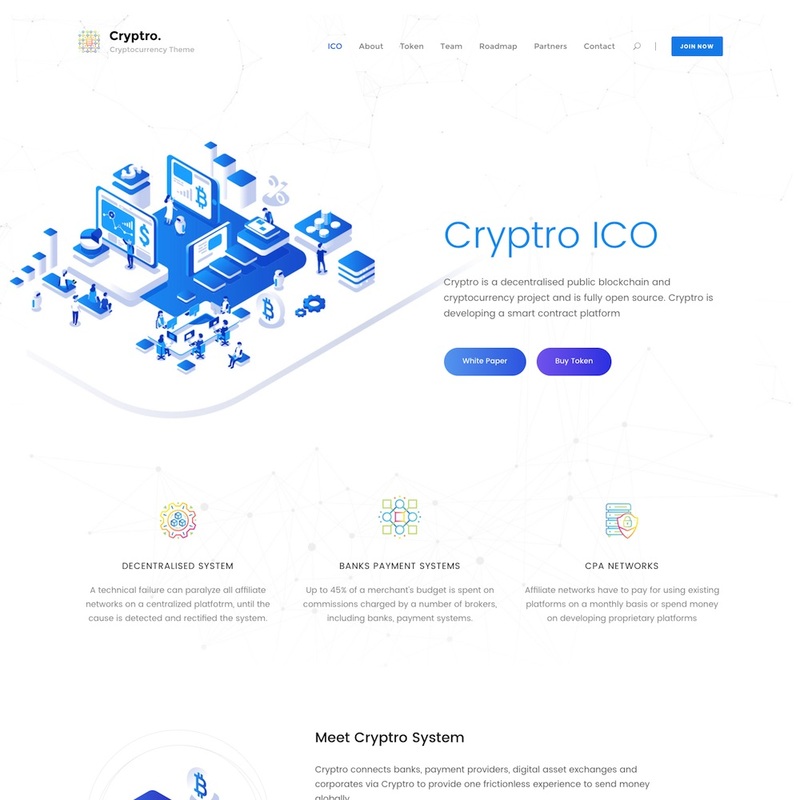 The Crypterio theme offers a robust WordPress based solution for ICO websites, blockchain consultants, crypto projects and cryptocurrency websites. The premium theme has a modern and versatile design that can be used for a variety of crypto websites including: ICO landing pages, ICO listing and directory websites, ICO and Blockchain consultants and advisors, cryptocurrency blogs and more. It comes is lots of ready-made homepage, blog and service layouts / designs and includes customizations options. The theme also includes lots of cryptocurrency specific functionality and tools. It has ICO whitelist pre-signup and smart contract integration. With this unique feature, ICO participants can effortlessly and securely register, pass KYC/AML procedure, get approved, and get listed on a Whitelist to purchase tokens during the Initial Coin Offering. Other features include: advanced ICO launch countdown, live exchange rates graph widgets, cryptocurrency converter, ICO listing / database, and much more. 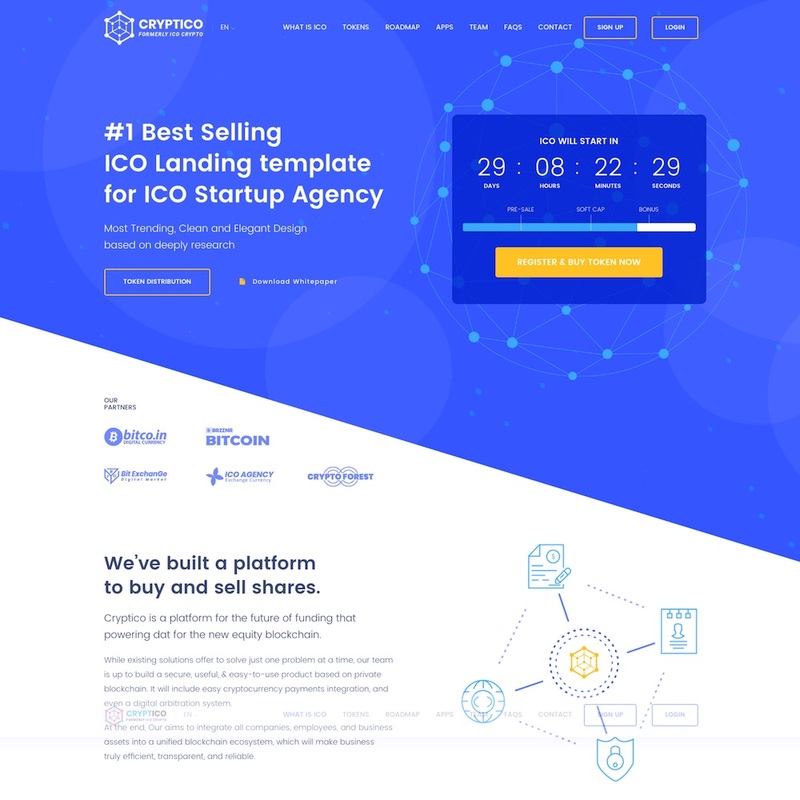 Cryptico is a premium WordPress theme that lets you build a professional and interactive ICO website for launching a new token sale. It has a modern and tech design with a number of different homepage design options, and customization options. 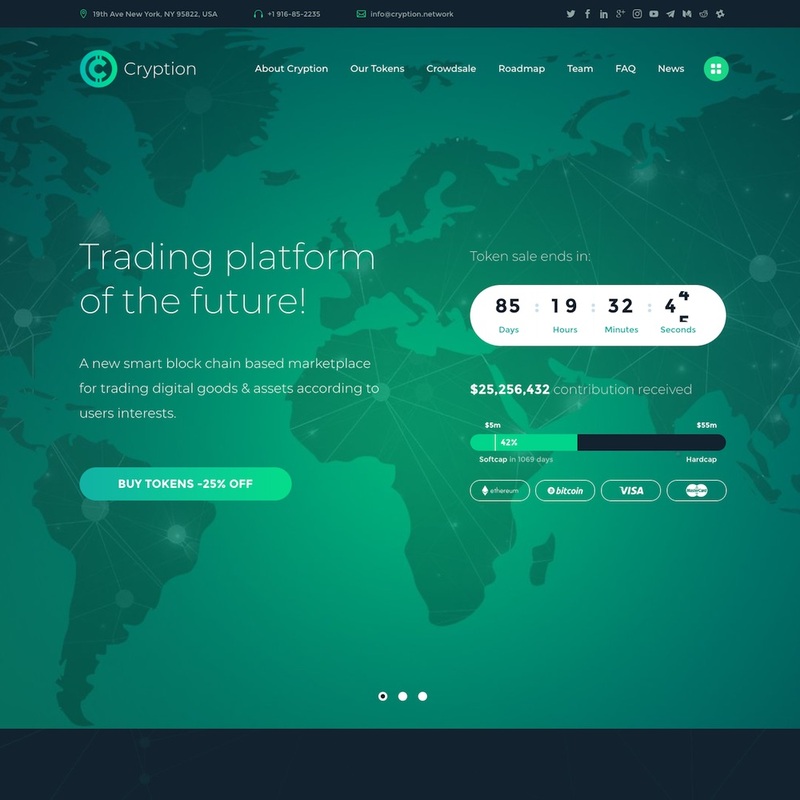 Crypton is a feature rich, multipurpose cryptocurrency WordPress theme for Bitcoin, cryptocurrency and ICO websites, crypto blogs and other blockchain industry websites. It has a modern and attractive design, extensive features and functionality and cryptocurrency specific tools such as custom cryptocurrency pages, coin price widget, multi-currency calculator and more. 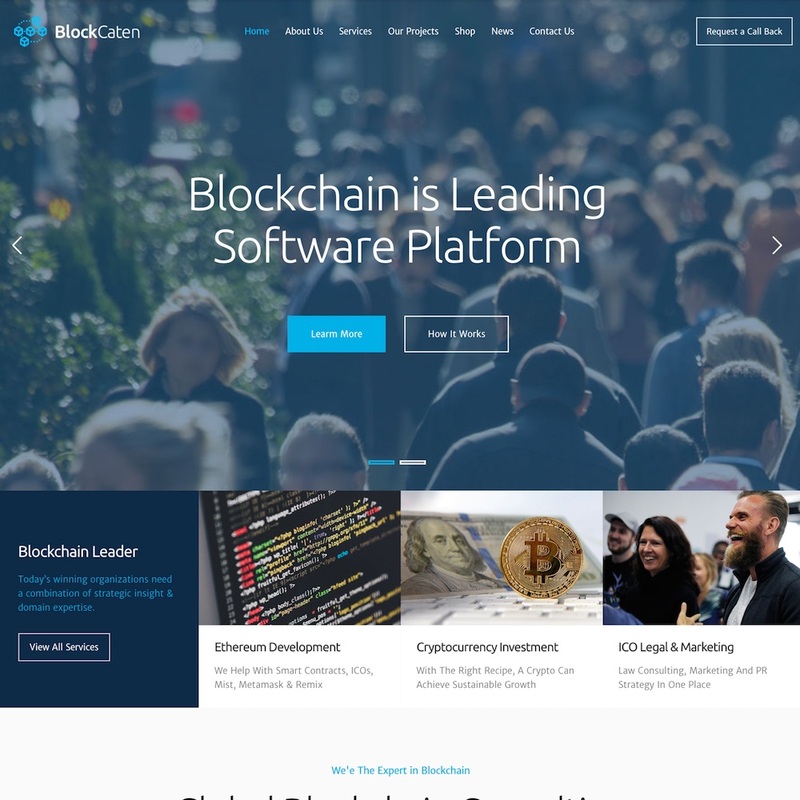 Tolarcek is a Bitcoin, Blockchain and Cryptocurrency blog theme for WordPress. The theme has a crypto / techy style and comes with built in support for a cryptocurrency WordPress plugin that adds functionality for displaying real time coin price charts and tickers, graphs etc. 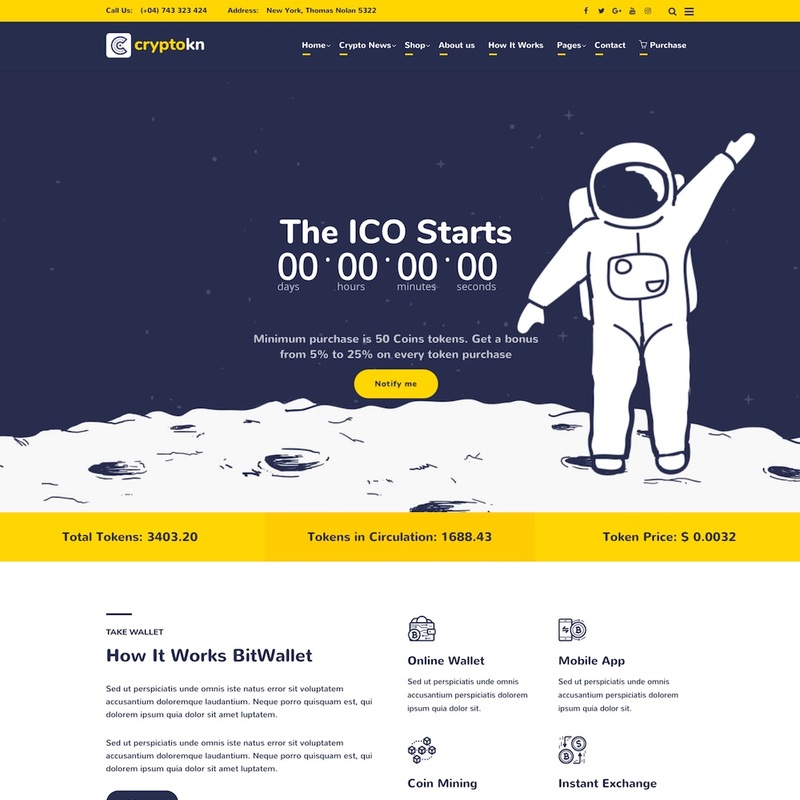 DigiBit is a WordPress theme designed for cryptocurrency news and crypto mining blogs and websites. 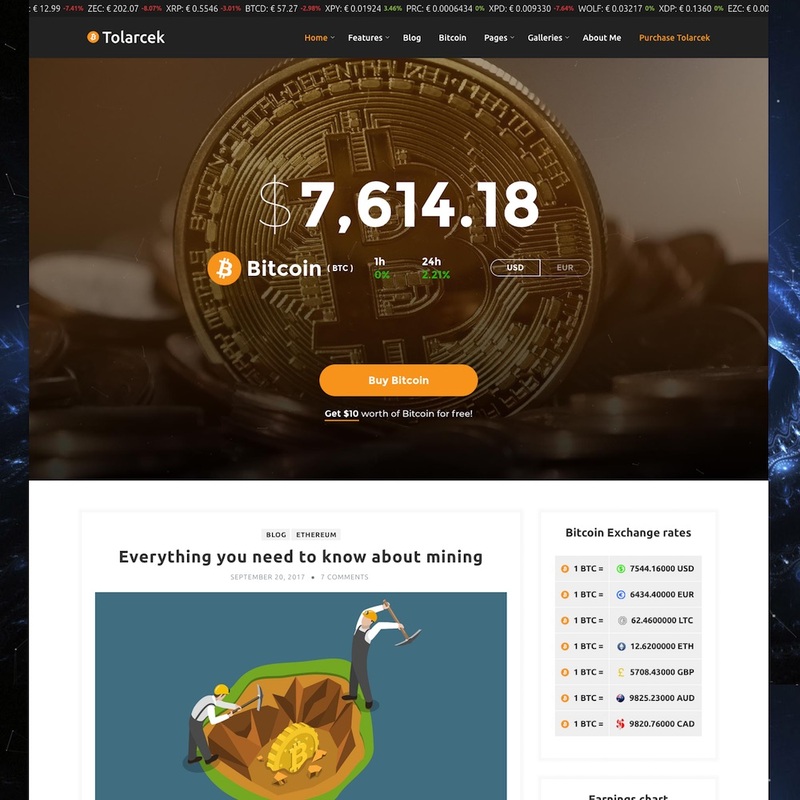 With a Bitcoin color scheme and tech style this theme copies the general design trend of many other major cryptocurrency blogs and news websites. 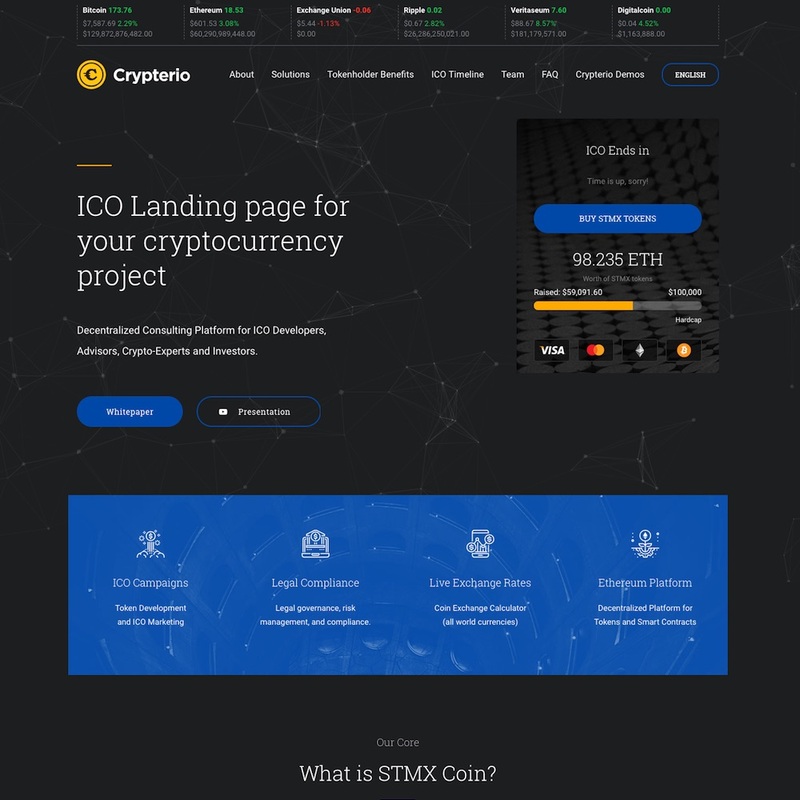 It comes with some custom crypto currency widgets, as well as numerous design and layout options, homepage designs variations, custom inner page designs and more. Creptaam is a WordPress theme for digital currencies and ICO websites. 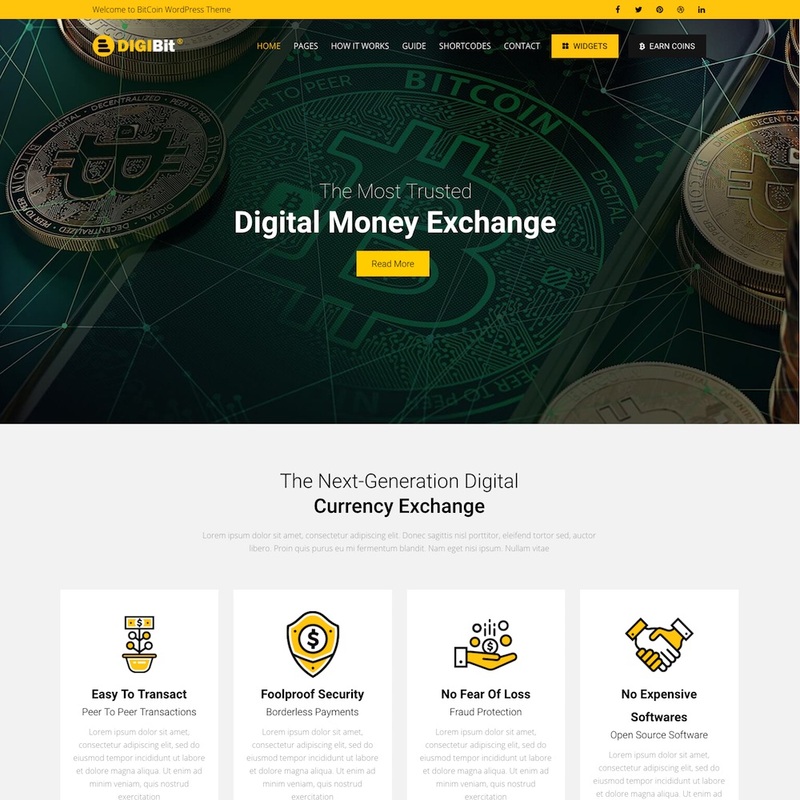 It has a suitable tech / digital currency style design and comes with a single page homepage design to display all the relevant information and also cryptocurrency related pages and sub pages.